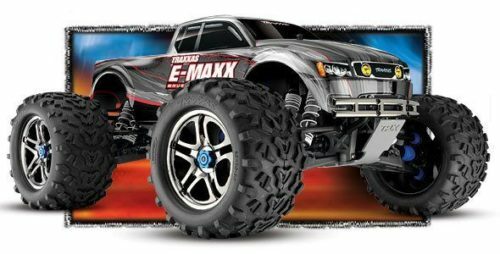 There is a time in one’s life when you should get yourself an RC car, one that can handle anything and everything that is thrown in its path from rocky terrain, boggy mud swamps all the way to lands and environments like desolate desserts that most cars wouldn’t dare to enter. For some this desire to find the best RC car is not the same as looking for an all-terrain rc vehicle. I started young when I was a kid, others start later in their teens. For some, this journey might have just begun and now standing tall as a parent you’re ready now to get outdoors on a monster truck adventure with your child by your side. The pavement is not as fun as it once was, smooth surfaces don’t give thrills as did before and now you’re thinking about finding a vehicle for pushing the limits of what is possible. Some say the impossible is only something someone hasn’t dreamed of yet and this is where the dreaming begins. Going off-road with your RC car requires some careful thought process and make sure you have an idea of what it is you’ll encounter. For example, mud is a different type of terrain than sand and snow again requires careful choosing before the final expedition. 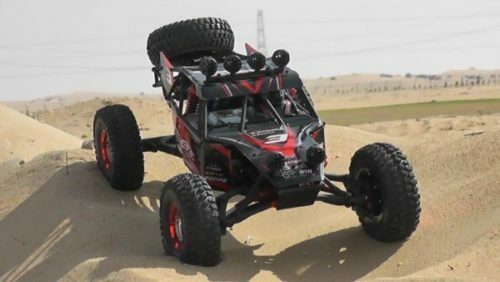 Redcat is racing brand and is well-known for producing serious RC vehicles and this is no exception, it is a monster off road rc car. Speed – This is around the same pace as a fast waking kid, but this car is not about speed. There are very others to compare to this when it comes to wheel-size. This has the ability to climb up rough and steep surfaces with all 4 wheels turning a the same time. This allows maximum grit and grinds so whatever it encounters it will overcome with power. Power – The battery is 7.2 voltage with 2000mAh and includes charger. This is powerful and the Everest 10 is designed to go as long as it’s not a 6-meter brick wall. Type – 4 wheel drive. 2.4GHz with Waterproof Radio System Receiver. Dimensions – length 46cm, width 26cm, height 160cm and the wheelbase is 32cm. This is high off the ground and with 9cm clearing it can handle bumping over rocks and bashing is not an issue when obstacles can pass underneath. Engine – This engine is electric with speed control at 45A and is brushed waterproof. This means that you can drive in the rain, over low-leveled water and will handle extended use, however, the brushes do wear over time. Terrain and surface type – This RC rider is able to use and ride on any surface and can handle any terrain with huge shocks and drive system built to handle the rugged environments. Everything from sand dunes to sticky mud this car will handle, especially with its four-wheel drive spin that keeps pushing when it would sink others into a stopping halt. The tires are meant to crawl up rocky terrain other vehicles are not capable of. They tackle boulders and with the awesome grip, they keep climbing until the seemingly impossible height is reached. Stones of all shapes and sizes do not matter to the Everest-10 with the laws of gravity being stunned into a distant thought. This is meant to scale and progress until there is no high plain to reach. The 4 wheel drive system combined with the massive wheels and the ground clearance make this a climber. The ability to outreach and then grip the next rock or boulder makes this a thing of class and beauty, while all at the same time looking mean. Ease of use – This is easy for teenagers and for those who like trying to overcome technical terrain this will be loads of fun and challenging. 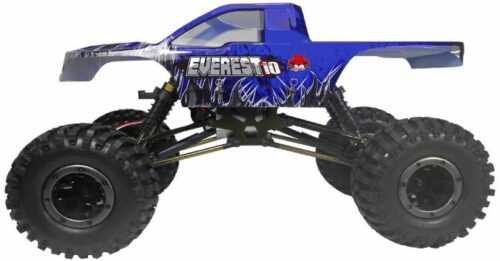 The big wheels are great this RC for snow use and have definitely got the Everest-10 feel with a fierce grip that will power through and handle the resistant snow, while others would fail this would continue and push on. This is a big wheeled truck that can crawl up rocky terrain and handle any environment put in its path. Some vehicles are made to scale and reach where other similar cars just cannot. Speed – This is fast crawler and can reach a top-speed of up to 25Km/h, which is faster than the other reviewed above. Power – The double motor can run for 10 mins and will handle long supporting control ranges of up to 100 meters. The 3 AA batteries give a good kick and torque is high with a grit that makes for a fun driver experience. Type – This is a crawler and designed for climbing, assailing and getting up and over terrain with ease. This has a 2.4GHz handheld device with an easy to handle turn left or right remote control handle. Dimensions – The truck size is 27.5 x 23.5 x 14cm and weighs 700g, which is similar to the Everest-10 overall. Engine – The electrical engine of this truck is 4.8v/700mAh Ni-Cd with a battery that handles play-time of around 10-15 minutes, which combined with the control range makes this good for extended use. The engine is charged with an 110v-240 voltage and can be controlled over 4 channels, which helps with cars with multiple uses. Terrain and surface type – This is designed for sand, rock, mud and any surface that it comes up against. This can rise above and scale rocky and rugged materials with ease. 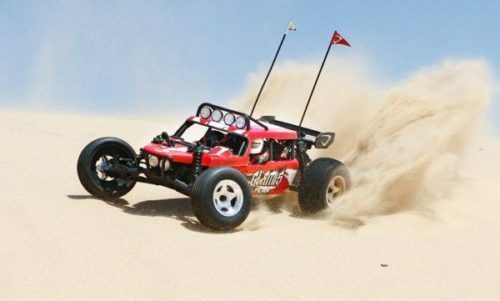 The big wheels and suspension make this enjoyable to use and can handle fast speeds over sandy dunes or slow and technical with expert precision. Ease of use – This is made to handle rough and rugged use under almost any surface and environment, which can be used to a point that makes things look effortless. This type of remote control car is for 8 years old and older. This truck is big and the wheels are huge, which help this tackle any terrain with ease. This is designed to make traveling over rock, sand, and mud as easy as possible with little traction resistance. Speed – The top-speed is 20 mph and is fast enough to be exciting for those who like the speed over landscapes and rugged terrain. Power – The battery powers this one with 8 AA batteries and has a lot more torque and grit than any other in comparison. The fully assembled truck makes this ideal for quick and easy, ready to go use. Type – The 2.4Ghz radio system runs up to 10 trucks and this is great for day trips with a couple RC cars or trucks of the same kind. This is a 4×4 truck and can scale, grip and push up rocky boulders. The size and scale are 1/10 and is a monster truck with 100% replaceable parts, which is perfect for long-term use. Dimensions – The scale is 1:10 and the dimensions are 15.8×12.2×7.5 inches and the weight is 8.9 pounds. This is similar in size to the RC Rock-Crawler, but wheel size is larger with the Redcat. Engine – The electrical brushed motor type is powered by the 8AA batteries and is fully waterproof for the wet and snowy terrain. Terrain and surface type – This can be used for all types of surfaces and features loads of capabilities, whether sand, rocky or muddy surfaced this can power on through, up and over. Ease of use – The truck is for teenagers and older. The manufacturing recommendation is 14 years and older. This is a challenging terrain with low-traction and the technical requirements for mastering the high sand dunes. Sand is a difficult environment because of high and low veering plains, like sand dunes, which can be unsuspecting and alluring for beginners. These can cause the car to get stuck and slow the fun down. There are techniques for driving cars or trucks on the sand and one of the best is not to use the clutch excessively and be steady with the torque because if you do the vehicle will get more traction and be less likely to spin-out. The best RC cars for sand is contested and some experts state that the wider the tire the more friction, but less force pushing forward, which means you gain more friction, grip, and drag, but as a consequence, you’ll have less economy, durability, and speed. Some prefer thin tires and like speed over the sand, which means technical ability is needed, otherwise, things can get bogged down to a halt. There are vehicles that glide over sand and offer little opposition from the traction felt by the smoldering tires. In this review, we will look into some of the best all-terrain vehicles for kid’s of all ages and compare to others designed more for rocky, boulder-like topography. The snow is definitely one of the most challenging environments to drive your car in. There are complications before even getting out riding, like getting it started and in extremely cold conditions things like batteries can freeze-up and weaken the battery. There are techniques to help with limiting this possibility and warming the controller and RC car in the vehicle before using is one. Another is if any of the battery cells are dead or weak then I would replace, it’s easy enough to do with the leading brands. The snow and icy conditions are similar to the rain and get into the RC box, which is becoming a problem. There are industry solutions to this and the protective gear encases the electrical elements, but sometimes the special water protective casing does not always provide perfect insulating. There are ways around this and an example is electrical tape being used around the areas that are particularly vulnerable, which can help protect against use in the snow. This should help with protecting the receivers, controllers and servos parts. Some can handle wet conditions and use this to their advantage, while others struggle in such conditions. 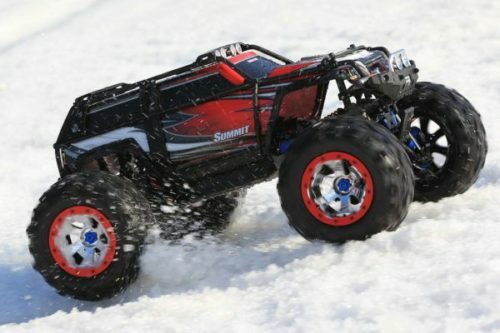 Snow can by an almighty-halt for some without the height clearance and finding the best RC truck to forge through the snow is a decision worth spending some time pondering over. 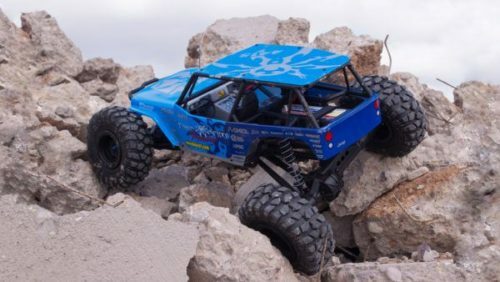 There are loads of times you want to tackle a rocky pile, but you’re unsure if your RC vehicle can handle the vertical angle that seems way too steep to drive up. This tough terrain and blisteringly steep environments are where new technological advancements have come to save the day by making the seemingly impossible now possible. The huge range of 4X4 vehicles has produced a wide range of cars that can grip and assail the most unlikely of obstacles. No boulder or rocky terrain is out of bounds (within reason) and with large chassis and off-road wide tires these are built to crawl. New drivers who go straight from the box out to ride can find smaller rocks easy to maneuver and scale up, around and over. This is harder when the easily chew-able rocks become obstacles that require technical ability rather than sheer force. However, find the car that offers all these features is difficult and sometimes the advertising on the box doesn’t always match the reality of the car’s capabilities on the hilly terrain.